For some, civic space in plentiful. But for me, civic space has always been a commodity -– that is, until recently. You see, I´m from Los Angeles. Los Angeles is both fascinating and complex. It´s large, complicated, and not typically on magazine’s livability list. But this is why I love it. It´s not European-style — it´s not anyone´s style. It is its own unique entity that can’t be compared to traditional city forms. And if you’re willing to give it a chance, it just might surprise you in a really great way. It is a city of serendipity. But as a result of all these reasons, Los Angeles is also one of the most widely misunderstood cities I´ve ever come to know. I´ve had a chance to learn from and/or live in other places, including: Zacatecas and Tijuana in Mexico, Boston and Cambridge, Washington, D.C., New Orleans, Buffalo. Still, there is no place is like Los Angeles. Currently I live in Barcelona. I am exploring civic space and cultural landscape policies and planning projects with the International Laboratory on Cultural Landscapes with support from MIT´s International Science and Technology Initiatives Spain (MISTI Spain). Although I find some similarities between Barcelona and Los Angeles in regards to climate, modernist design legacies, and natural landscape, the cities largely differ is their history, culture, and in their approach to urban planning and development. 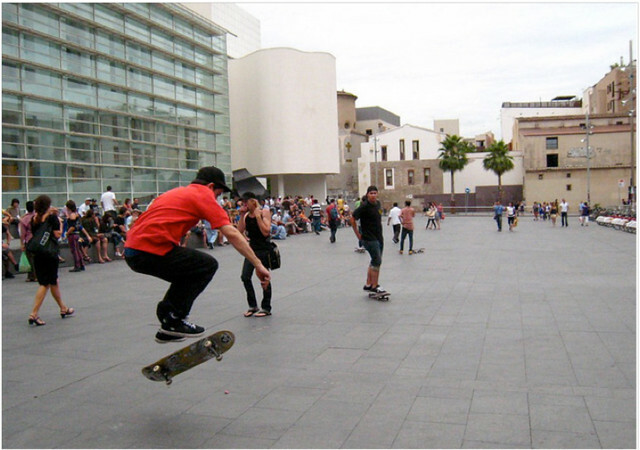 Skateboarders in front of the Plaça dels Àngels in El Raval. Over the next few weeks, I will use this blog to chronicle and reflect upon my ideas of various projects–both temporary and physical–associated with Barcelona’s public realm. These may include entries about: Barcelona’s recent Mobile Design Conference: Designing the Networked City, Mozilla’s recent international open source learning conference, Drumbeat Festival, on the Plaça dels Àngels in El Raval, a review of the FabLab BCN (a lab for the development of youth ideas in urbanism and technology), reflections on the programs and tours related to Any Cerdà (Cerdà Year) and the El Centre de Cultura Contemporánia de Barcelona (CCCB) that celebrated the 150th anniversary of Barcelona’s urban plan and “extension” in the Eixample, and other ideas as they come along. Frankly I realize that in my time here, I too am an immigrant. I’ve seen the Gaudí and Miró. I’m no longer a tourist. I have limited paperwork to stay and although I’m fluent in Spanish, I don’t know Catalán, the preferred language of conversation. Perhaps this series will also explore how I consider my feelings and thoughts about civic space in Barcelona as an outsider. La Mercè 2010 festivities along Las Ramblas. The importance of creating multi-use spaces for social interaction is a necessary factor in all cities and communities. If in the end the city is its people, than so to should the people be the city. Because civic spaces are the site for everyday practices, they are also the first line to generate new ideas on how to use, consider, and live in the city. What can we learn from Barcelona´s transformative civic space and its role in the contemporary city? I hope to provide offer some enlightening thoughts. Great idea! I’m looking forward to following the series as it unfolds. 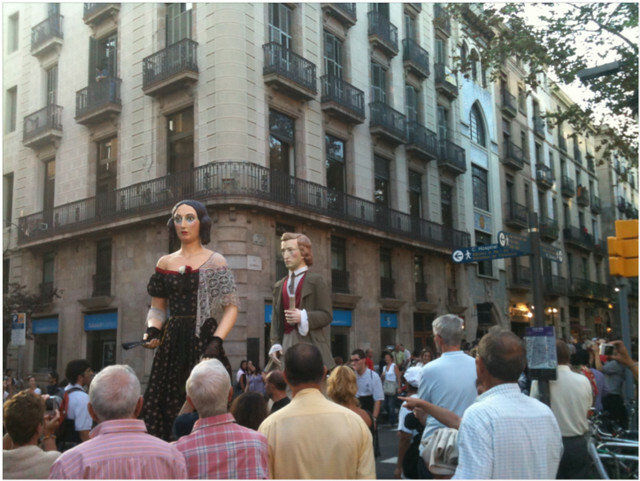 This also encourages me to find out more about La Mercè and other street festivals in Barcelona. I lived 8 years+ in Barcelona and I even worked for Barcelona’s city government. The understanding of civic space is very similar all over Spain, and Barcelona is, perhaps, the leading Spanish city in regards to conceptualizing and realizing civic space. The city government is the most important actor, actively shaping and generating concepts and spaces. It strongly controles urban development. It defines how the private sector and citizenry act upon the city. And the city government is strongly influenced, even controlled, by architects. This is nicely explained by Llátzer Moix’s book “La ciudad de los arquitectos”. The main architecture school, ETSAB, is closely linked to the city government, formally and informally. It’s a classical example of enlightened despotism. Most of Barcelona’s people trust their city government and architects, not without critique and opinion. Perhaps this trust is behing the fact that the same party (Socialist Party) has won every single election in the city since the first democratic elections in 1978 (33 years), althouth these last years have been the weakest for the government and the party and there’s a possible change coming. It will be interesting to see how Barcelona’s former mayor, Joan Clos, performs and influences the world’s urban development as UN-HABITAT’s executive director. If I’m not wrong about LA, it should be very interesting to compare how Barcelona’s enlightened despotism and LA’s individualism generate civic space differently. Thank you for your comment! I apologize for my delayed reply. I appreciated your insight, especially as someone who is familiar with Barcelona, but not with Los Angeles. This provides me with some interesting points to consider. LA is definitely a special city where there is more than meets the eye. While it’s not a city of traditional physical beauty, it’s cultural diversity, creative energy, and ability to go against the grain really set it apart. There is certainly the stereotypical LA, however I wish the real LA had more opportunities to present itself. I hope my continued work in Los Angeles can help shift ideas and perceptions about LA. There is a great sea change in both the design and perception of civic space in LA these days, from parks to bike paths. Just as BCN was able to undergo a complete transformation, Los Angeles may be on a similar path. Thanks for your tip on the Moix’s book – La ciudad de los aquitectos. Coincidentally, my friends pointed me in this direction after I arrived in BCN. It’s a really interesting read and gives a good background on all the successes (and challenges) leading up to the 1992 Olympic Games.